Butternut squash is hands down my favourite vegetable – I love it roasted, in risottos or whizzed up into a soup. My husband, on the other hand, is not as keen on the orange starchy vegetable but, thanks to the Jamie Oliver cookbook I received at Christmas, we have now found a dish we both enjoy. The recipe for Squash Rigatoni is featured in Save with Jamie and I have only made a couple of small changes – I use rosemary instead of thyme as we both prefer it, gluten free pasta as my husband can’t eat wheat and I have sprinkled some pancetta fried in garlic oil over the pasta before serving. 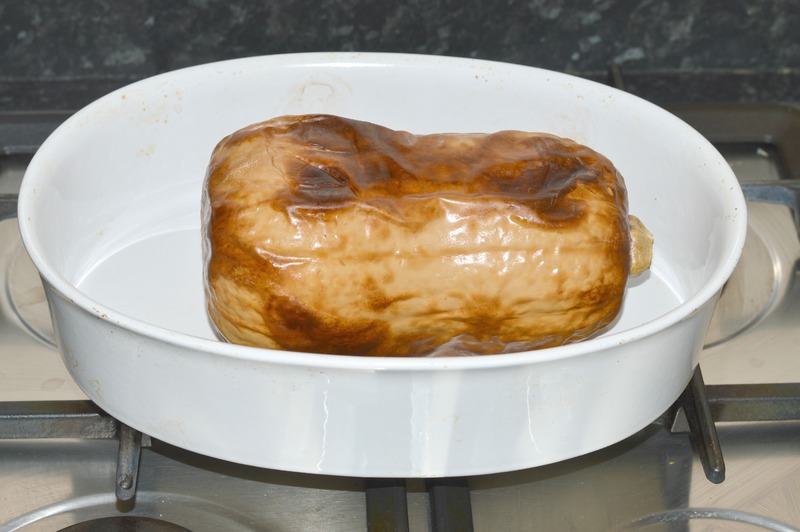 Start by roasting a whole butternut squash in the oven (180 degrees/gas mark 4) for one and a half hours. 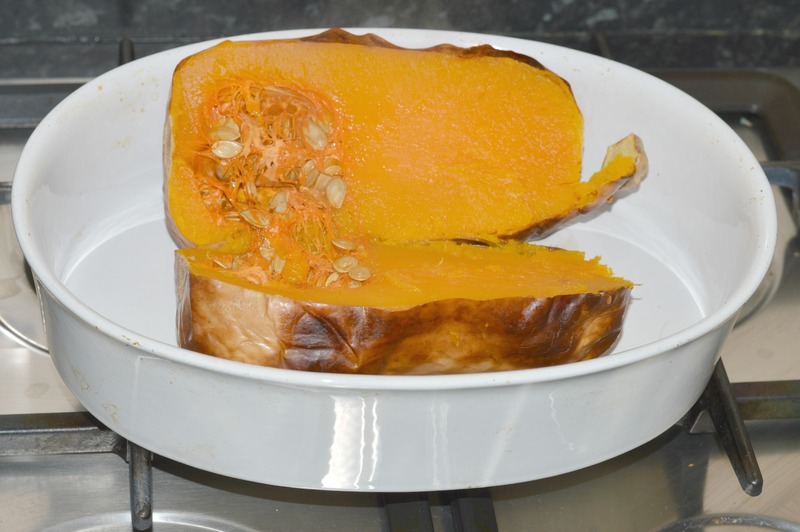 Once it is cooked, split it in half, deseed and scoop out the flesh and either use right away or save for another day. The recipe only calls for half a squash so you can use the leftover flesh to make soup or another of Jamie’s recipes such as squash houmous or squash fritters. Put a generous splash of olive oil and a pinch of dried chilli flakes into a large pan on a medium heat, then strip in the leaves from the thyme (or in our case rosemary) and squash in the garlic through a garlic crusher. Fry for one minute then add the creme fraiche, blue cheese and a splash of boiling water. Simmer gently while you cook the pasta according to the packet instructions, then drain reserving a cupful of cooking water. Season the squash mixture, toss the pasta through it, loosening with the cooking water if needed. 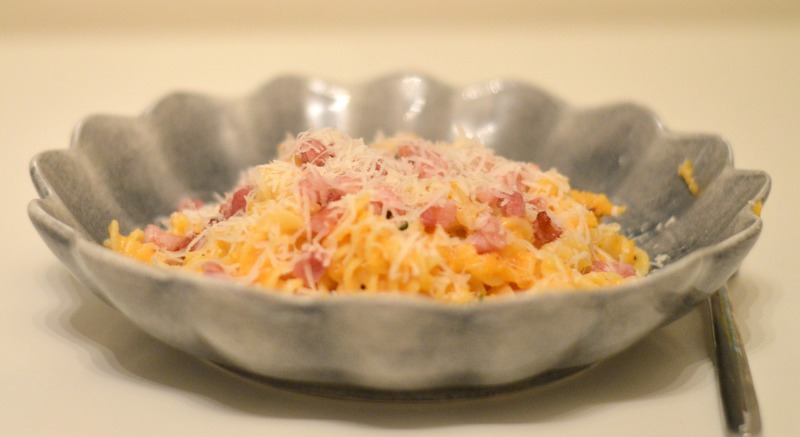 If, like my husband you don’t feel you’ve had a proper meal unless it has some meat in it, fry some pancetta cubes in a pan until just crispy and sprinkle over the pasta along with parmesan cheese before serving. Apologies that my pictures aren’t the best – I cooked this in the evening and with no natural light it is hard to make food look appetising. 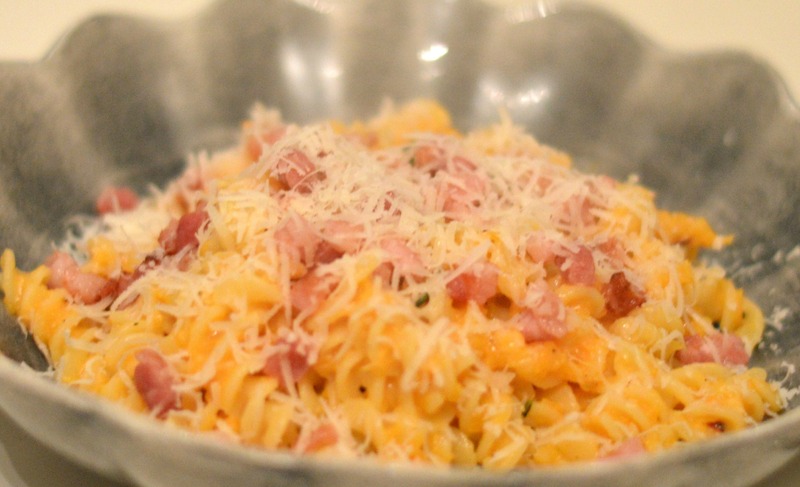 But take my word for it, this recipe is definitely worth trying!